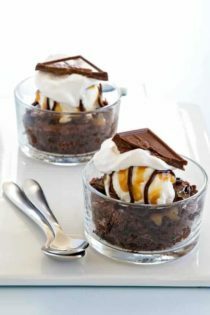 Completely decadent Brownie Sundaes made with Ghirardelli SQUARES Stuffed Brownies. THIS is the dessert to slow you down so you can savor every moment! This is a sponsored post on behalf of Ghirardelli. All opinions are my own. Thank you for supporting the brands that continue to make My Baking Addiction possible. You know what the one thing about this whole Mom situation that throws me for a loop sometimes? You NEVER. Slow. Down. Not for one single second. Before we had Elle, I know I was busy. Heck, I even felt overwhelmed with life a lot of the time. And then we added a whole other human being’s every need, want, and whim into the mix, and holy moly. A lot of the time, my needs, wants and whims simply have to come second. I think it’s important to point out that that is not always the case. I adore my baby girl more than anything in the world, and she is the center of my universe – but I would prefer she grow up seeing a mama that takes time for herself, that takes care of herself too. Because self care is important for being a whole human being. And I want Elle’s mama to be a whole human being. And this whole human being? She loves taking a few stolen moments with some delicious chocolate. There’s nothing like savoring a decadent Ghirardelli Chocolate SQUARE-stuffed brownie topped with vanilla bean ice cream and chocolate sauce, let me tell you. This Mother’s Day, I have homemade gifts on my mind. I loved this idea Ghirardelli put in my head about taking time out to savor things. You know where else you do that? The spa. So I’ve put together these beautiful individual mason jars full of all the good stuff a mama would need to pamper herself – to take a little time out to just BE. 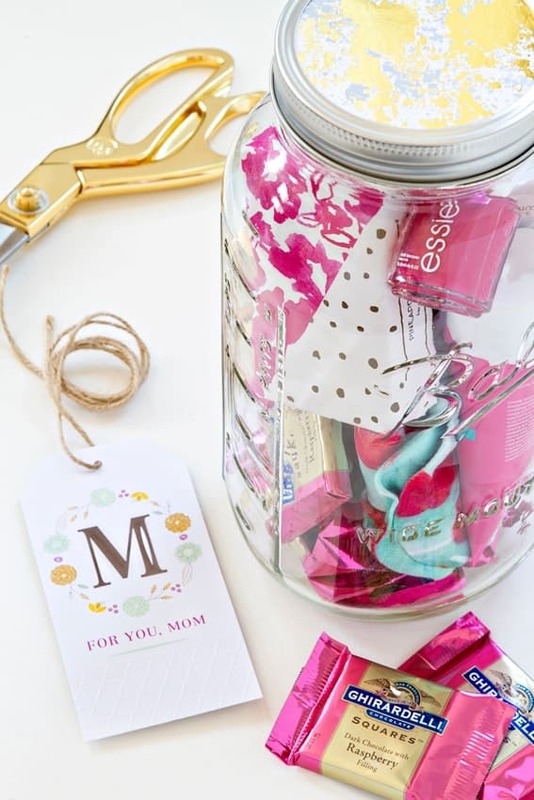 Filled with Ghirardelli SQUARES, lotions and potions from Sephora (sample sizes), a candle that smells divine, a bath bar, and nail polish, these pretty mason jars are so easy to make. They don’t take long at all, but they really put forward the idea to any mother in your life that she should take some time for herself. As does this crazy good Ghirardelli Brownie Sundae. Who wouldn’t slow right down and linger over every bite, amiright?! First, you take a basic brownie recipe and then you stuff them full of your favorite Ghirardelli SQUARES (I used Milk & Caramel). Bake those up to perfection, but allow them to cool for a bit, and then slice them generously. Serve each brownie up with one scoop of the purest vanilla bean ice cream you can find (bonus points for flecks of vanilla bean throughout the ice cream), and cover it all with chocolate and caramel sauces and a dollop of whipped cream. I mean, come on. You don’t even have to tell Mama to sit down and enjoy her dessert. She’s going to sit there, and she’s going to have a special moment or 10 with this over-the-top, one-of-a-kind, made-by-you dessert. Happy Mother’s Day, to all the mamas out there. Whether you have furry babies or grown babies, or a brand new baby – Mother’s Day is your day. Savor every moment! For more ways to savor moments with mom, be sure to check out Ghirardelli for recipes, tips and delicious pairings. 1. Preheat oven to 350°F. Line an 8×8 inch baking pan with foil, leaving about 1 inch of the foil extending over the edges of the pan. The extra foil will create handles that you can use to lift the brownies from the pan. Spray foil with nonstick cooking spray. Set pan aside. 2. Microwave chocolate and butter in a large bowl microwave-safe bowl at medium (50% power) for 2-3 minutes or until butter is melted. 4. Spread 1/2 the batter into prepared pan. Add an even layer of Ghirardelli Milk & Caramel SQUARES and cover with remaining 1/2 of brownie batter. 5. Bake for 30 minutes; do not over bake. 6. Allow to cool thoroughly and cut into large squares. Top with vanilla ice cream, caramel and chocolate sauces, whipped cream and cherries. Brownies and Sundaes are my favorite deserts, put them together and you get heaven. Holy smokes!! This sounds awesome! That melted ice cream, yes! It’s my favorite too. Thanks for visiting. 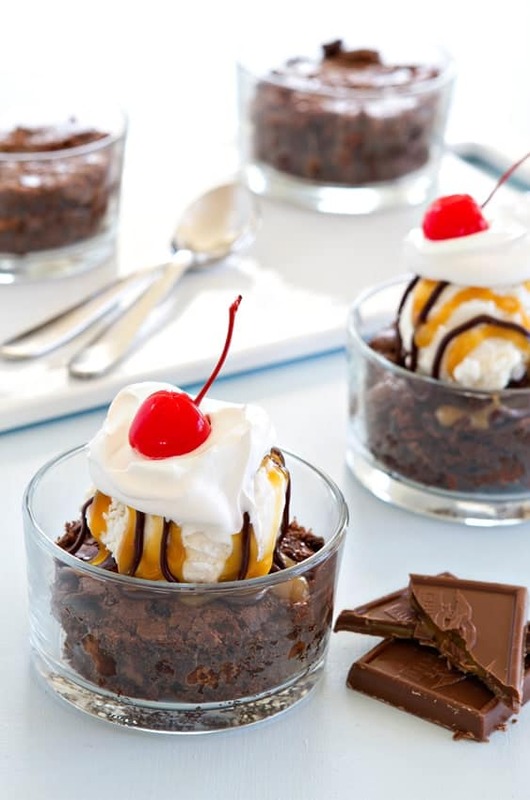 I need these brownie sundaes in my life…and the gift ideas…LOVE them!! I hope you get the chance to try it. Thanks so much for visiting. 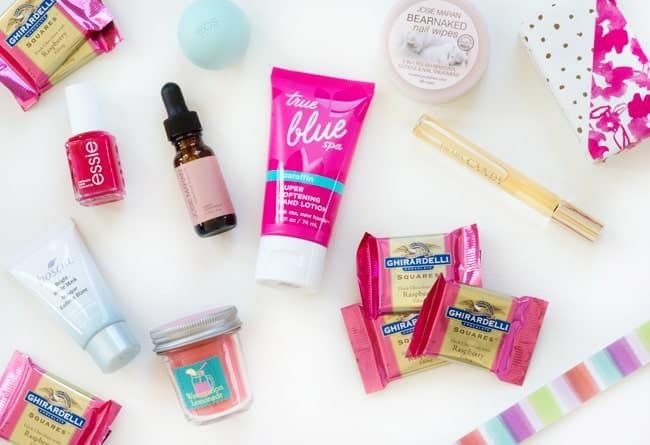 Loving these sundaes and the mason jars stuffed with beauty goodies! Such an awesome idea that you can totally customize. Anyone would be happy receiving these gifts! Thanks so much, I’m glad you liked the idea. I appreciate you stopping by. This looks delicious. Brownie is my favorite ice cream topping, hands down! And it’s even better when it’s the ice cream topping the brownies, right? You just can’t go wrong with brownies and ice cream! Thanks for stopping by. Thanks so much for stopping by. I hope you get the chance to try them! Holy yum! I love Ghirardelli squares! This recipe sounds so good! I will definitely be making these soon! Thanks for sharing!! Hi, Victoria! I hope you enjoy them!